Above is a photo of Manning School of Business student scholarship recipients and benefactors. 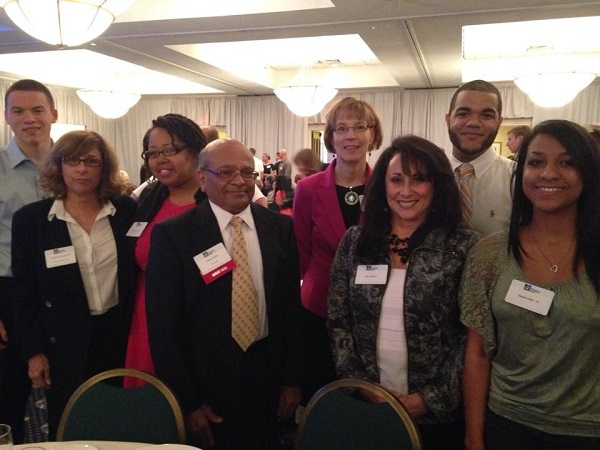 This past Friday, I was fortunate enough to participate in the Celebration of Scholarship at the UMass Lowell Inn and Conference Center. There, my fellow student scholarship recipients and I met the benefactors who made our scholarships possible. I am very glad that I’m still learning what “business casual” means and dressed more formal than necessary. The luncheon was far more formal than my peers and I expected. This was a good thing though. The fact that the luncheon was more “business formal” represented the importance of the event. Furthermore, it was metaphoric of the heights student recipients are able to reach with a little help. Naturally, receiving a scholarship brings joy and relief to the recipient and his/her family. What isn’t often brought to light is the affect that this brings to the benefactor. Going to the luncheon made me realize how much providing the resources for education means to benefactors. Every single benefactor at the luncheon showed interest in helping a complete stranger. Most importantly, the luncheon brought to reality how much heart our University has. Several of the benefactors were UMass Lowell faculty and staff members. They recognize the reality that without their help, many students wouldn’t be able to attend college. The luncheon allowed all recipients and benefactors to recognize the special relationship they share. The financial burden of college is a struggle for thousands of students in the nation. It is far too easy to walk away from higher education because of the debt that comes with it. I am proud to say that I have seen first-hand, the willingness and motivation that UMass Lowell demonstrates to assist its students financially. I am grateful to have participated in an event that highlighted the large impact that philanthropy has on our University community.